As I have always said, for the police, there is no such thing as a routine traffic stop. 33 year old Sean Bolton, who had been with the force since October 2010, was shot and killed Saturday night during a traffic stop. As Officer Bolton was conducting the traffic stop, he was shot by someone inside the vehicle he had pulled over. The incident took place at approximately 9:18 PM local time near Cottonwood and Perkins Roads Saturday night. Officer Bolton was taken to Regional Medical Center in critical condition, and later passed away. Bolton had been with the force since October 2010. The murder suspect is still on the run. Our prayers go out to the family and friends of Officer Sean Bolton and to the Men and Women in Blue of the Memphis,m TN police. 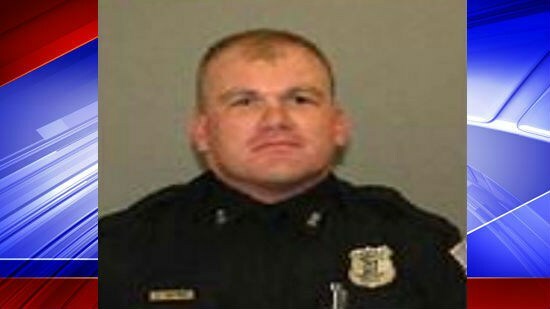 A manhunt was underway for a suspect who fatally shot a Memphis police officer during a traffic stop on Saturday evening, according to officials. Memphis Director of Police Services Toney Armstrong said police were notified at around 9:18 p.m. local time (10:18 p.m. ET) that an officer had been shot. The officer was rushed to the hospital in critical condition but later died from multiple gunshot wounds. “The suspect responsible is still at large and officers are in the area attempting to locate him,” police said in a statement. The slain officer was identified by the police department as 33-year-old Sean Bolton, who had been with the force since October 2010. Armstrong said Saturday’s fatal shooting was the third time an officer has been killed in the last four years. Bolton, who graduated from White Station High School in 1999, served a tour in Iraq. He studied political science at the University of Memphis. Bolton served as best man at his brother Brian’s wedding at Woodland Presbyterian Church on Park Ave. on June 20. Less than two weeks after that wedding, Bolton’s father died on July 2, according to his Facebook page. Memphis has become a very dangerous city. Traffic police should not be working alone in those conditions. The policies of Obama have emboldened the thugs in all of the big cities and LE has become their target.